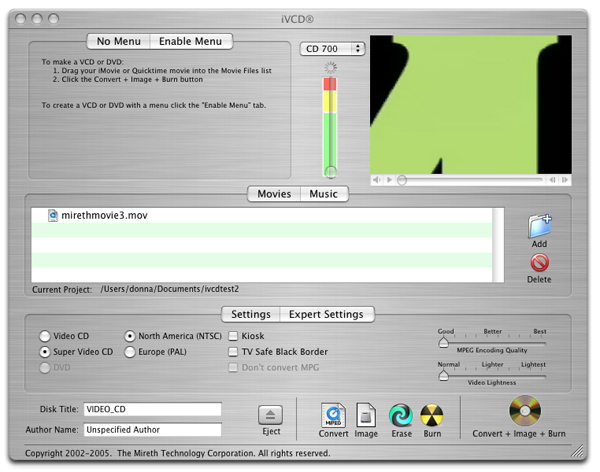 Make VCD/SVCD/DVD with this easy to use MPEG converter/encoder/burner software for Mac OS X. Convert from avi, divx, mpg, mov, iMovie, iMovie HD, Quicktime movie to MPEG and burn to DVD,VCD, SVCD, XVCD or XSVCD in just one step. This software has all the features you need and the ease of use you really want from an MPEG encoder/ VCD burner - just drag in the source files and press the burn button. Create with or without menu, looping VCD, more. Qweas is providing links to iVCD for Mac 3.3 as a courtesy, and makes no representations regarding iVCD for Mac or any other applications or any information related thereto. Any questions, complaints or claims regarding this application iVCD for Mac 3.3 must be directed to the appropriate software vendor. You may click the publisher link of iVCD for Mac on the top of this page to get more details about the vendor.